When I first started this website, I wanted to use it to raise money for charity as well as awareness about bicycle transportation and bike advocacy. Since I hate to ask for money, I haven’t been very good at raising it. However, right now our good friend, Bobby Forster, really needs our help. He was diagnosed with ALS just last Christmas, and what started last year as some weakness in one of his arms has progressed way too rapidly to almost total paralysis. It is painful to see our friend, who just a few months ago was riding bikes with his friends and driving pedicabs, in such a helpless state. He has had to buy a special wheelchair, a wheelchair-accessible van to get around, and hire a full-time caretaker. He also has a feeding tube and will eventually need a tracheotomy. Since he obviously can no longer work, Bobby and his family need as much support as they can get to keep living and fighting this horrible disease. If you can spare anything (even as little as $5), please donate to his fund here. 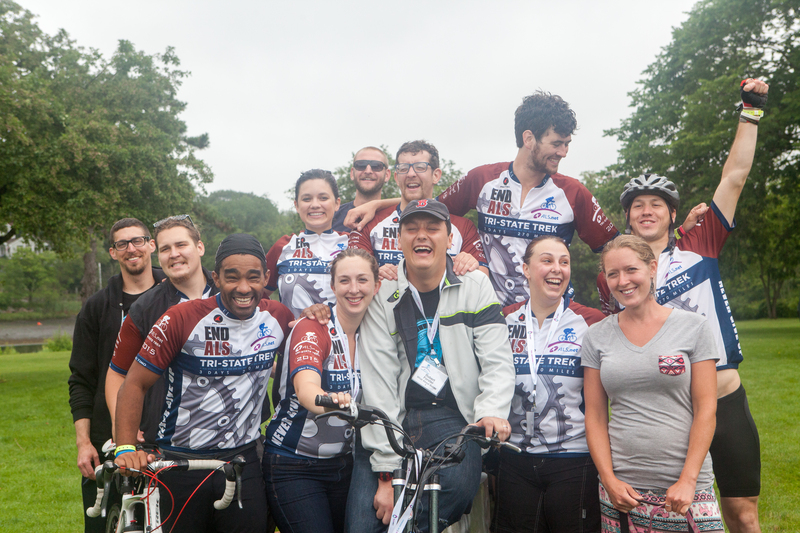 Always smiling, Bobby (in the Sox cap) is surrounded by amazing friends who participated in ALS-TDI’s Tri-State Trek bike tour this summer to raise money for ALS research. I met Bobby when I became a pedicab driver in Newport, and I worked with him again in New Orleans. He is one of the most positive, welcoming and friendliest people I know, and he’s the main reason why I ended up pedicabbing in New Orleans. I can’t picture Bobby without having a smile on his face. He’s also an incredibly active person, into sailing as well as cycling, so I can only imagine how difficult it is to have his ability to stay so active taken away like this. You can read his story and find out more about ALS through that link, and you can also read Bobby’s updates to his own blog at www.acureforforster.com. One last thing – If you want to directly fund research for finding a cure for ALS, you can simply text “ALS” to 80077, and you will magically donate $10 to ALS-TDI, an organization that has been working tirelessly since 1999 to search for a cure or treatment. Sarah grew up in Cranston - just south of Providence, Rhode Island - and developed a love for travel, music, and outdoor sports at an early age. She had started bicycling long distances at age 12, as a participant of the MS150 bike tours to raise money for the MS Society. She didn't use her bike regularly until she built her own while studying in Montreal and found it an excellent way to get around the city. After graduating from McGill and moving back to Providence, Sarah started working at Brown University's office of Environmental Health & Safety as the Biological Safety Specialist. She was living 4 miles away at the time, and for the first few weeks was driving to work. She made the switch from driving to bicycling when she realized that she could get to work faster, avoid parking tickets, and integrate a few miles of training into her day. Bicycling was better for the environment and better for her own health and mood. She found that she had more energy and felt much happier once she started biking to work. When her car broke down several months later, she never bothered replacing it. After 4 years of working in Biosafety (and on her master's in Environmental Studies), Sarah left her job to pursue her passion. She has been working various jobs in the bicycle industry since June of 2011, including pedicab driver, bicycle tour guide, bike mechanic and traveling bicycle advocate. In between seasonal jobs, she has done a few long-distance bike tours, which is the main reason for this blog. Her dream is to eventually ride around the world and sail across the oceans. Posted on 12 November 2015, in Uncategorized and tagged Acureforforster, ALS, ASL-TDI, Bobby, charity, donate. Bookmark the permalink. Leave a comment.